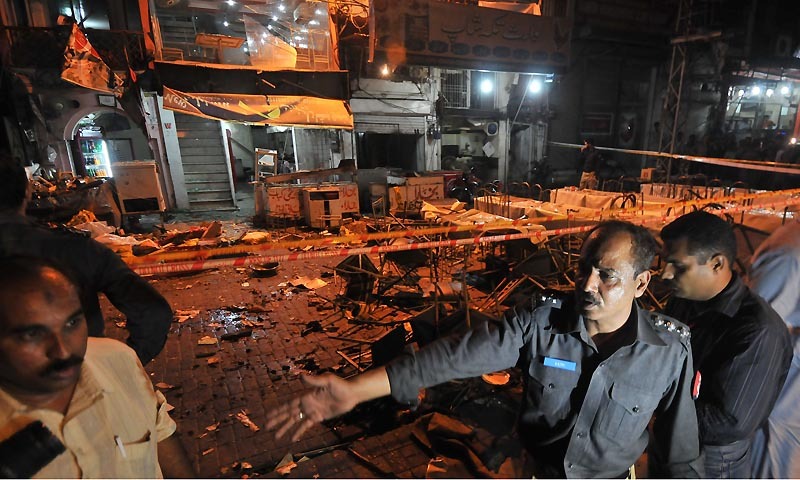 LAHORE: As the death toll in Saturday’s Old Anarkali bomb blast rose to five on Sunday, police took more than 80 suspects into custody for interrogation, but without any significant breakthrough in investigation. However, a police official told Dawn that a group, calling itself Baloch Liberation Tigers, led by Meeran Baloch, had claimed responsibility for the attack in phone calls made to the Balochistan media and police. The official said that the Punjab police had been informed about the claim by their Balochistan counterparts. According to sources, seven senior members of banned groups were picked up for interrogation in connection with the blast. Soon after the blast, policemen deployed on posts on various roads in the city began checking car and motorcycles and impounded several vehicles after their drivers failed to show registration books. A device containing about 500g of explosives in a polythene bag placed beneath a deep freezer on the footpath in front of a food outlet in the busy Old Anarkali Food Street went off on Saturday night. A six-year-old girl was among the dead. 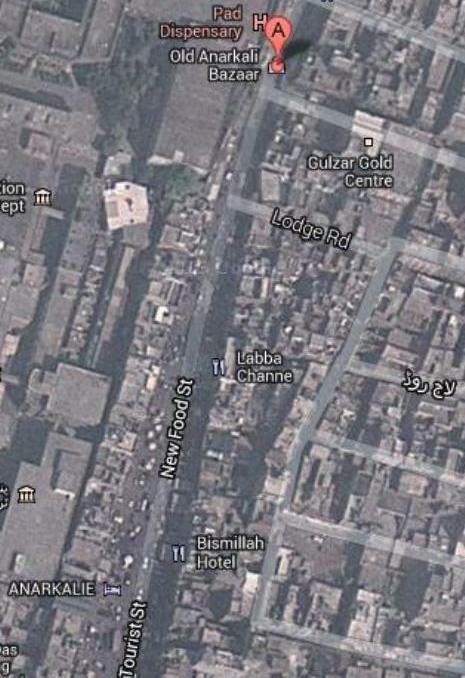 According to witnesses, dozens of families were dining at the peak hours when the blast shook the locality. Of the 47 people injured in the attack, 11 were discharged from the Mayo, Sir Ganga Ram and Services hospitals after treatment. Dozens of Afghans and Pakhtuns and food street workers were among those taken into custody during a search operation. Most of them were not carrying their identity documents. Police also quizzed residents about their guests. Police intensified security around the City Railway Station, bus stands, Sunday bazaars and important buildings and places. A case under Sections 302 and 324 of the PPC, 3/4 of the Explosives Act and 7 of Anti-Terrorism Act was lodged at the Old Anarkali police station on behalf of the state. A police investigator told Dawn that forensic experts had cleared the crime scene after collecting evidence and samples of the explosives had been sent for analysis. He said the intensity of the blast had increased because it also blew up the compressor of the freezer and empty soft drink bottles lying at the place. The investigator said police could not find any clue from CCTV footages obtained from various shops. Inspector General of Punjab Police Khan Baig and Lahore DIG (Investigation) Zulfiqar Hameed inspected the crime scene and gathered details of the investigation after Chief Minister Shahbaz Sharif sought an immediate report. The chief minister, who was in China along with Prime Minister Nawaz Sharif, asked the law-enforcement agencies to utilise all resources to track down the assailants. Mr Baig said police were looking at the case from different angles and the terrorists would be brought to justice. He said police would ensure comprehensive security for citizens during Ramazan. VICTIMS: Six-year-old Sadia, 18-year-old Farhan of Baghbanpura, Shujaur Rehman of Bhalwal, 16-year-old Noman Iqbal of Faisalabad and a 35-year-old man were killed. A Mayo hospital morgue official said four bodies had been handed over to their families. TO borrow an idea from sociologist Victor Burner, terrorism in Pakistan has become a social drama. Almost every passing day offers something new, dramatic and unusual. Terrorists provide the lead by carrying out planned attacks in different parts of the country. Next follow the rituals and rhetoric. The authorities’ security briefs, political condemnations and citizens’ vigils are scenes from the same drama, which inadvertently keep terrorism intact. The handling of militancy in this way by officialdom has added to the spectacle of violence, with the public imagination imbued with the thought of ‘more to come’. Even though he retracted his statement, his denial does not make the issue less important. Unfortunately, fear has pushed the entire civilian infrastructure into a state of confusion. If the opposition in KP blames the Pakistan Tehreek-i-Insaf government for its lack of courage to pass an Assembly resolution against the killing of 10 foreign tourists, the statements of politicians at the centre see a conspiracy behind the attack. There is political caution in not linking this drama to the logical perpetrators — the Taliban. The political and military solution lies in perpetuating the ritual, instead of ending it. Some aspects of our national character are also at work here. Decades of exploitation have cultivated in us the seeds of self-denigration and self-pity. The standard comment on a road that is bumpy, a bureaucrat who is exploitative and load-shedding realities is ‘this is our country’. Yet, there is the example of the Taliban in the same country whose performance is impeccable. In fact, it is hard to believe that somebody from this land can work so diligently to destabilise the country. Let’s not get distracted. My focus is not on the argument that rhetoric (statements) and rituals (Assembly resolutions) can dent the militants’ strength. I want to elaborate on the absence of political resolve, which has left people complacent with the situation. We should not ignore the fact that without political resolve, the official response through rhetoric and rituals can only lead to acceptance of terrorism. It is happening right now, where people feel the effects and see scenes of acts of terrorism, but they can’t find the way out. Official confusion and lack of resolve is clearly translated in the public vision to understand the drama. So far people largely believe in what they are told by media, politicians and state officials. They need to break away from this pre-determined path by avoiding an approach that understands terror only in a black and white form. They have to challenge the state apparatus for its role in not curbing terrorism, the way they need to hold accountable all those supportive of militancy. Through provocative statements, the forces of status quo still interpret their jihadi vision while sitting in public ranks. They test the water from time to time by reinforcing their identity, ideas and ideology to ensure that they still are the guardians of the ruling militant discourse. After a wave of violence in Quetta in which militants set alight the Quaid’s residence and killed several university students, the Jamaatud Dawa chief Hafiz Saeed reiterated his jihadi commitment. While appealing to militant organisations to stop attacks inside Pakistan, he reiterated that ‘jihad’ would continue outside Pakistan. In plain words, he gave with one hand what he took away with the other. Even in the midst of insane violence, provocative jihadi statements reflect that the archaic notion is still intact, which in the past had menaced the very continuity of the sway of the security institutions and their proxies. Why then should we lament if one section of the proxies defies the strategic expectations of their mentors and falls back on us? The outcome is already reflected in whatever is happening all around. Ten years of fighting against militancy should have helped us learn that terrorism is not going to end unless the state initiates steps to neutralise radical leaders. By serving as vital cogs in a predatory militant wheel, these leaders provide the youth with a reason to join militancy. 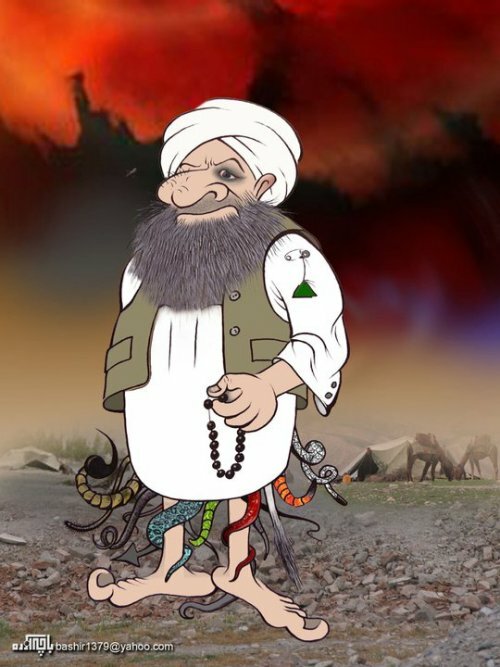 It does not need extra intelligence to understand that the jihadi enterprise of ‘bad’ Taliban is the reactionary outcome of the social process, which was adopted in the past to create the ‘good’ Taliban. The country has already paid a heavy price for this militant project, which was patronised by the state, exploited by politicians and recognised by society. We have to understand that any discourse has other than purely intended consequences. Therefore, encouraging ‘jihad’ against others is not free from repercussions. According to sociologist Wagner Pacific, “words build bridges to actions, and some people will choose to walk over those bridges”. We, therefore, cannot stop the ‘bad’ Taliban from using the same militant discourse to fight against us. After all, militants of all stripes abhor democracy the way they detest peace and radically translate progress. With so much in common, what differentiation can we draw between the good or bad Taliban and ‘jihad’ here or there? Pakistan already has reached a stage where its people cannot afford to let confusion rule their collective imagination. Change in the earlier jihadi worldview is vital for snatching the initiative from the forces of status quo, which set the agenda for the militant discourse. In a situation which has become a matter of grave concern for peace-loving people all around the world, allowing the radical mindset to provide us with ideological and material initiatives means we all share a role in fomenting militancy. The writer is a journalist and PhD student at the Southern Illinois University, Carbondale, US.